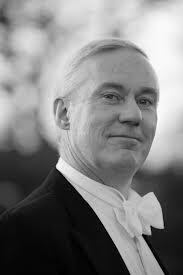 Our Music Director, Clifford Lister, began his musical education as a chorister at Winchester Cathedral, later winning a choral scholarship to The King’s School, Canterbury, and subsequently studying singing with Kenneth Bowen and the late Clara Taylor at The Royal Academy of Music. Whilst at the Academy, he moved from the post of Lay-clerk at Canterbury Cathedral, to a similar post in Westminster Cathedral, where he remained for the next twenty years. Since November 2007, he has been pursuing a freelance career, concentrating on teaching (Christchurch University, Kent College, Canterbury, and, of course, privately), and concert work, as well as continuing to sing in, record with, and tour with the Cathedrals of Rochester, Canterbury and Westminster on a part-time basis. On the concert platform, Clifford is no stranger to many choral societies in the South and South East, although he has sung as far afield as Bahrain and Oman! Recent engagements, in addition to the standard repertoire, have included Chilcott’s St John Passion, C.P.E. Bach’s Magnificat, the Britten War Requiem, and a world premiere by Adrian Bawtree. 2019’s highlights include Messiah with Sutton Valence Choral Society, Bach’s St John Passion in Canterbury and Puccini’s Messa di Gloria in Wales. Plans for later in the year include conducting the Vierne Messe Solennelle in Chimay, Belgium, and, closer to home, Handel’s Samson. Clifford has been our Music Director since 2001, and under his guidance both the Thanet Chamber Choir and Thanet Festival Choir (of which he is also Music Director) continue to flourish, bringing music of many genres and styles to this corner of Kent. Occasionally the two choirs come together to fulfil a particularly exciting project; the St Matthew Passion and Mozart Requiem are past highlights, and the most recent collaboration was Handel’s Israel In Egypt, presented in November 2017. The next joint venture is still to be decided, but will probably be in 2020.